Our department specializes in the treatment of children and adolescents with cancer, blood disorders, immunodeficiencies and severe lung conditions. 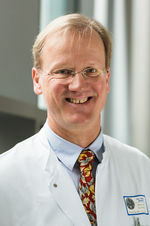 We are one of 4 departments of the University Medical Center for Children and Adolescents, Angelika Lautenschläger Hospital, of Heidelberg University, a leading German center for pediatrics and adolescent medicine. Families who come to us are frequently very worried and anxious about their child. They can rely on our dedicated and professionally trained team of doctors and nurses who treat their young patients with loving care and the latest therapeutic methods. Children and their parents are also supported by experienced specialists such as psychologists, social workers, music and sports therapists, as well as our kindergarten teachers and the Heidelberg Hospital School – both during and after the treatment on our premises. Our mission: helping and healing – in an environment of reassurance and encouragement! We believe that modern research is a crucial element of healing: cutting-edge technology, international teams and innovative studies all work together to consistently improve our young patients' chances of recovery. Take a look at our website and find more information on the Department of Pediatric Oncology, Hematology, Immunology and Pulmonology. Please follow this link Information for patients to find out how to get in touch with us. Please follow this link How to find us to get information about directions.